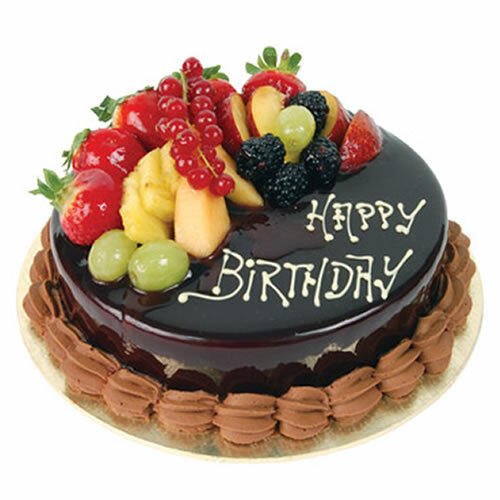 If you have forgotten the birthday of your mother as well as you’re loved ones and want to make up for the mistake, send this cake to them with the help of same day cakes delivery in Jaipur service. This beautiful chocolate with fruit cake will melt their heart. The round-shaped cake is covered with chocolate cream. It is topped with fresh fruits including cherries, kiwi, etc. This cake not just tastes delicious, but also looks eye pleasing. The cake can be sent anywhere Giftjaipur, which is the best online cake delivery service in Jaipur and major cities of Rajasthan. Surprise your wife on her birthday or anniversary.You can surprise your friends by gifting them this hamper on your farewell or fresher. Diabetic should take Extreme care while having cake.Keep the stem of flowers in water to give long life to your wonderful bouquet. You can increase the weight and size of cake as per your need. Delivery guarantee may not apply for timings: Valentine’s Day, Mother’s Day, Friendship day.